Getting rid of dirty energy – let’s have it clean. It is probably obvious that I spend a fair bit of time pondering ways to create a better world (after all, I do work for Greenpeace). The aspects of building a better world are ever so diverse, but clean, green energy is clearly a crucial one. There are many scientifically proven ways to what we call an Energy Revolution; to come to live in a world with clean energy. However, I’m ever so surprised that those in power, our decision makers, will not stop investing in dirty energy -whether governmental officials or business people. And seeing as they are indeed people, just like the rest of us, the ‘demand for energy’ argument does not stick: Why would anyone want to put up with so much filth, be it air pollution, be it spills? When regarding their long term view: what is the use of making money off of dirty energy if it effects us to an extend where we will not have a world to live in anymore, because we have over-heated the place? Young people, those who represent the future, surround our decision makers. What are these decision makers saying to them? How can we influence that message? 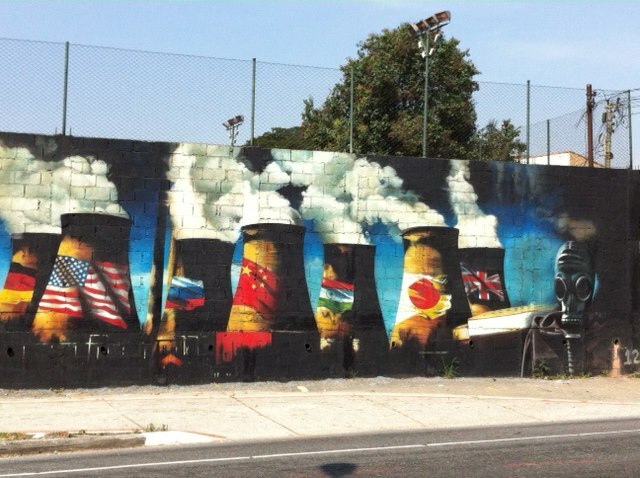 The mural in the image I came across near our office in Sao Paolo says it all, an artist’s impression of what nuclear does to you. Even if we don’t have all the answers or solutions, we know what steps we need to start taking, at an individual level as well as an organisational level. I have hope that many will. ← The power of reading, crucial part of holidaying.